Hey friends, today’s post is of the sponsored variety … featuring the one and only BLACK+DECKER and their fab Pivot Vac. I think it’s pretty neat-o and I hope you do too! And, as I’ve chatted before, it makes me smile and is super helpful when you engage in these posts – plusalso, there’s a giveaway to be had! Yippee! I’ve confessed before that I’m not a super housewife when it comes to cleaning. I manage clutter and don’t let the dirt get too out of hand, but the deep cleaning tends to get, well, pushed under the proverbial rug. Once a year or so, usually in the spring, I roll up my sleeves and force myself to do a little grunt work. I hate it, but Merry Maids isn’t knocking down my door so what’s a girl gonna do? I’ll tell ya, I don my apron, crank up Lourdes (or the Frozen soundtrack if I get outvoted) and go hunting for those darling dust bunnies. 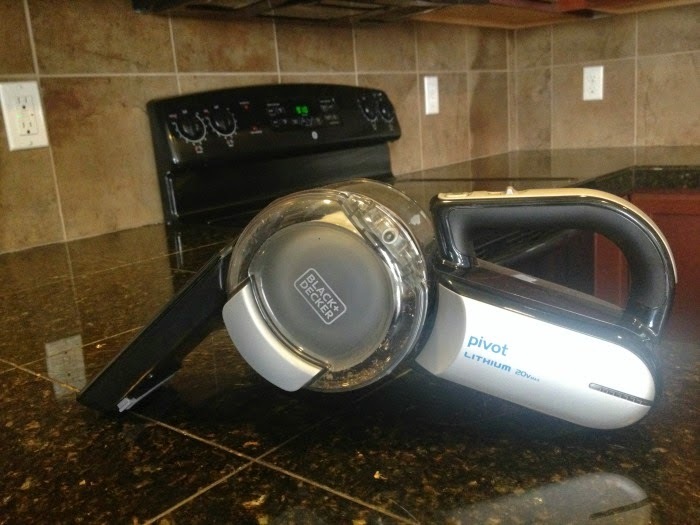 This year I decided to kick off my spring cleaning in the kitchen and what better companion than the BLACK+DECKER Pivot Vac. It can get in all the nooks and crannies that a normal vac can’t reach and being cordless it’s an obvious go to for small messes. Wipe down cabinet door fronts, wait, you don’t have sticky little fingers leaving hand prints everywhere? Ready to get your spring clean on? You can win your very own BLACK+DECKER Pivot Vac – value of $79.99! To enter, you must first click here and take a peek at the features of the BLACK+DECKER Pivot Vac. Then, leave a comment sharing your favorite feature and what mess or deep clean project you would clean up first. Submit your comment on or before May 15, 2014 and I’ll contact the winner on the 16th! I like that the filter is washable and its rechargeable! I would clean the kitchen in my apartment first, it could use it! I love the shape of the nozzle! It looks like it would be good for reaching hard to get to spots. I would clean my kitchen! I love the way it pivots to get in the difficult to reach places! I need this! I like the pivot nozzle. I would first clean the nooks by the cat's litter box, then the crumbs deep in the couch, then…oh the ideas are endless. I love that the nozzle moves so you can get all sorts of spots! I would clean the nooks and crannies in the new apartment I'm moving into in May. Thanks for the giveaway! Favorite feature are the removable washable dirt bowl and filters. We have tray (sp?) ceilings with crown molding that has space behind for lighting and I'm sure it needs cleaning ~ that is one thing I would use it for but it hadn't occurred to me to use it on the oven until I saw your post and definitely would use it for that, too. Oh goodness, that nozzle-y, spout thing looks like it will help me keep my car CLEAN. I spend far too much time hauling the shop-vac up from the basement to the garage! And also, I am in the market for something hand held to help with all the little spills that come with kids and a dog! I love the pivot nozzle…I have lots of tight spaces that need vacuuming! I love the pivot nozzle and that it is cordless! "Superior suction capability" sounds pretty awesome to me! I'd start with the little space between the wall and washing machine. I love that its cordless..perfect to keep in the car!!! Washable filter!!! Love that, less to replace. Oh my goodness! This absolutely amazing! I am expecting my first this week and would love to keep a clean house – I love the 3-stage filtration system with a pleated filter design offers the highest level of filtration to help prevent clogs and improve air exhaust! Ain't nobody got time for nasty air and germs! I like many of the features but particularly the long lasting battery. I am a father of 5 kids 6th grade and younger, so I am frequently cleaning out snack food crumbs from the mini-van or cleaning up the kitchen table or floor after a meal, and our current hand vac loses power after a few minutes. I like the 3 stage filter system and I would start with cleaning in the oven drawer it seems to get dirty a lot. I love that the filter is washable! Great feature! I like the Translucent bagless dirt bowl. This will help me clean up after my cats. They dig in plant pots and spill the dirt all over my carpet. I LOVE that it is bagless. I would use this to clean my car. I have a dog that sheds like crazy when i take her to the park. I hate taking a huge vacuum out to clean it up. THE On-board brush and extendable crevice tool IS THE BIGGEST SELLING POINT FOR ME. I WANT THIS TO CLEAN MY FURNITURE. THIS TOOL WITH HELP ME GET IN EVERY POCKET AND SEAM. I love that the nozzle is moveable for cleaning in tight spaces. I think it would be great to clean up messes in our RV. I love that it has the thin pivot nossle! I have hardwood floors throughout all the house and it is hard to sweep or vacuum behind furniture and this would come in so handy!! My Favorite Feature Is The 3-Stage Filtration System With A pleated Filter Design. 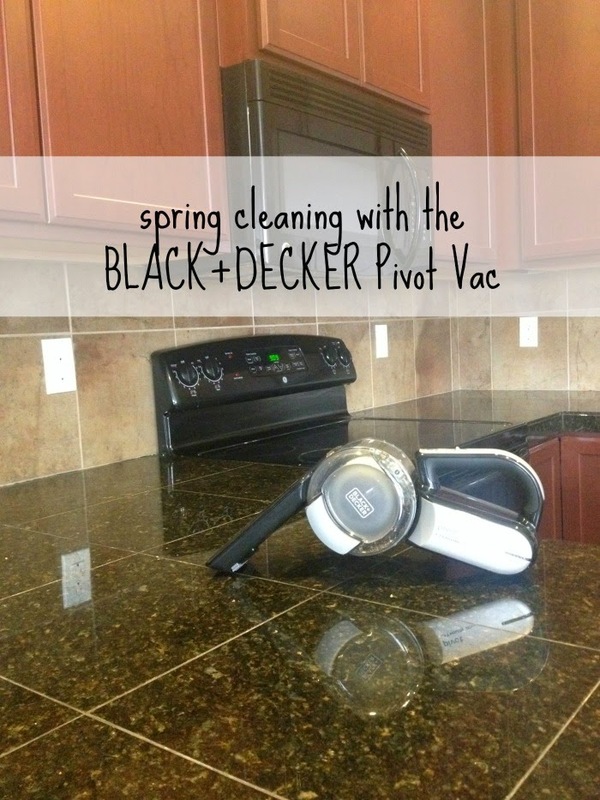 I'd Organized And Clean Up My Garage With BLACK+DECKER Pivot Vac ! The best thing about this little vacuum is that my kids would fight over who got to vacuum!! I would most definitely start in my car! I like that it has strong motor, a charging base, and it's bag less. I want to clean under the rolling shelves in the cabinets, and this would be great for getting cat hair off the couch. I also would use it on my oven. I like the 3-stage filtration system for my allergies. I love that it has a charging base and is cordless! I would seriously use it everywhere! I love the triple filtration! I LOVE EVERYTHING about this lil vacuum! Mainly that it is little and all washable! I like the washable filter and the extendable crevice tool- goodbye Cheerios in every crevice in my car! 3-stage filtration system sounds great! I would love to use this for the car to clean up all the messes from my little ones! Prevents clogs! Every vacuum we’ve ever owned has gotten clogged and it’s so annoying! I’d love one that doesn’t! I love the pivoting nozzle! I would definitely attack the kitchen cabinets with this! 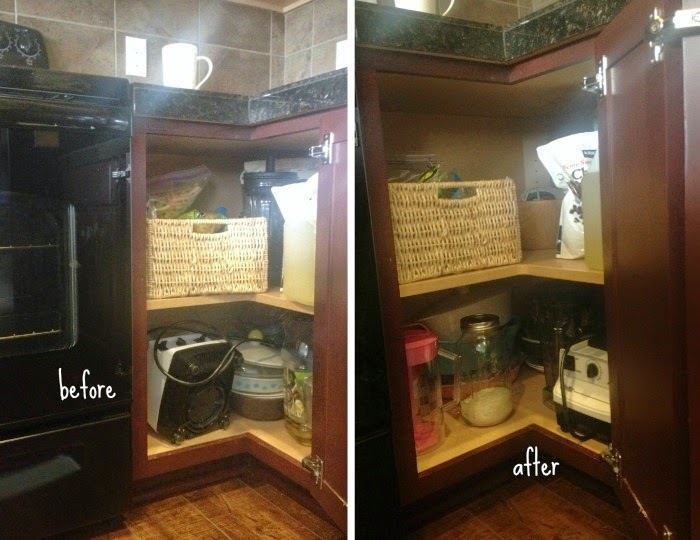 the swivel action for easy storage. I really like the convenient charging base and the removable washable dirt bowl and filters! The first mess I would clean up would be under the cabinets in the kitchen. I mean I always think I get them with the broom and/or upright vacuum but who am I kidding!!! I LOVE that it’s cordless! This means that I can actually clean with my 1 year old around – who just loves playing with cords and following them to the wall! I would use this thing throughout my whole house – oh and car! Love the shape! I would use it to clean my car.